Since the middle of the year, the California Bay Area Rapid Transit system (BART) has been hit by a series of “flash mob” robberies. Between May and June, groups of 40-60 young people jumped fare gates and streamed onto trains, robbing and terrorizing passengers. 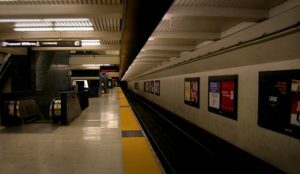 The robberies usually took place in the Oakland stations and typically around 9:30pm. Cameras installed on the trains lead to the arrest of several of these individuals, but similar style robberies involving smaller groups have continued. Fortunately, one such robbery was foiled by Leonard Brown, a 62 year old off duty security officer. Although Hamill’s concerns are grounded in good intentions, they will ultimately undermine not only BART, but the very racial communities she sought to protect. In a multiethnic country like the United States, the various racial groups will, at times, be jealous and resentful of each other. During times of racial tension, the government cannot be seen to favor one group or disfavor another, or it will only increase racial tension. That is the entire point of the Equal Protection Clause of the Constitution. How Can We Move Past This? In the past, certain minority groups, mostly African Americans, were completely disfavored by the state. However, we cannot write those wrongs by favoring, or even appearing to favor, African Americans now. If young people of color did indeed commit this violent crime, then not only should they be punished, but the public has a right to know who they are so that they can protect themselves or help the police in their search. Indeed, even “riders of color” would benefit from having the identities publically available; there is nothing in the reports to suggest that these robbers would not target people of their own racial group. And if the robbers are not African American, it would greatly benefit the African American community to have a video proving that. If the videos are not released, many people will conclude that race relations – or even racial identity – is more important than protecting passengers, any passengers, regardless of skin color. This will fuel even more racial tension and will bring about the unfair characterization that Hamill feared. Indeed, the return of white supremacy and the rise of the “Alt-Right” have shown just how dangerous seemly innocent protection of otherwise criminal activity can become. Racism and disparate impact are real issues that minority groups face, but those minority groups can lobby on their own behalf without the assistance of government officials who are supposed to remain neutral. If Hamill and others want to avoid wrongful “characterization of riders of color,” she should post examples of positive contributions that people of color have made rather than try and shield the bad apples from the consequences. Leonard Brown, the sixty-two year old security guard who stopped one of the robberies, is African-American himself. If Hamill wants to heal the racial divide and do her job, she can promote men like Brown who do the right thing. Every racial group has good people and bad people – the challenge should be to foster that understanding of duality instead of sweeping the bad people under the carpet. « Can Social Media Impact Your Injury Claim?